The Bastetani or Bastuli were an ancient Iberian (pre-Roman) people of the Iberian peninsula (the Roman Hispania). They are believed to have spoken the Iberian language. 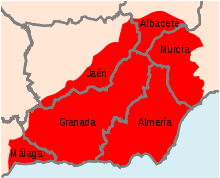 Their territory extended through present-day the south part of Albacete, Almería, Granada, the eastern part of Málaga, and the southeastern part of Jaén, as well as the western part of the Murcia Region in the southeastern region of the Iberian Peninsula. Their main towns were from Baria, present-day Villaricos, to Bailo (Cádiz), as well as Malaka, Abdera, Sexi and Carteia. Wikimedia Commons has media related to Bastetani. This page was last edited on 8 December 2018, at 02:29 (UTC).